But that’s not a reason to stop, we thought. That’s why we recently added the possibility to..
That’s right. There’s now no name anymore that cannot be changed. You want to change your project’s name? No problem. You want to change your account’s name? No problem. 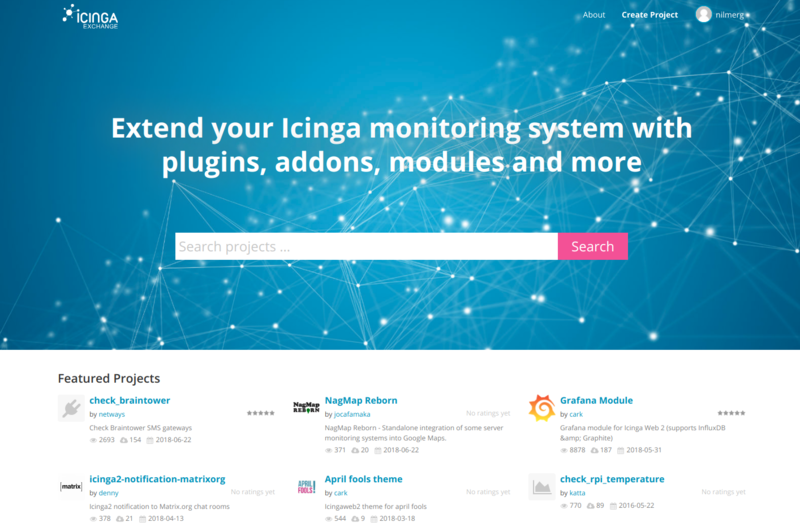 You want a different name on Icinga Exchange than on Github? While you’re logged in using Github? No problem! And on top of that, since these names are part of your project urls, Icinga Exchange remembers your previous names and issues automatically a redirect for old urls. Nifty, eh? Of course, your previous names are still yours. You can switch back anytime and no-one else is able to use them. Oh, and no, plus signs are still not allowed. Surely there is. I’d not write a blog post without it. A single heading is not enough, after all. Projects with many releases (and I mean one hundred and forty five) get their release listings split up into parts of three. If you want to know how it felt prior to this change, click here. Project introductions (the short paragraph beneath your project names), comments and reviews can now use inline Markdown! That’s a no to tables, I’m afraid, not. No, no, no. I don’t want to imply that previously featured projects were not.. good enough to be featured. I mean, surely, there’s always room for improvement.. But, no, actually it’s the other way round. Now the smaller (less obvious) projects also get a chance to appear on the front page. And for a longer, guaranteed, period of time so that they can be seen by many. As if we’ve had not enough about the GDPR lately. Well, it’s actually not about the choice if you want to receive notifications. Nah, you’ve got more options to choose which notifications you want to receive! You can still turn off everything if you want..
Because editing releases didn’t work. It did also allow to upload more files than intended. And didn’t care much about file sizes. Okay, it was outright broken. It works now. A nightmare for all who do not manage Git tags or Github releases yet. Support for the icingaexchange.yml has been dropped. Nothing is lost. What was previously contained in this abomination is still preserved, but frozen in time. There’s not much sense in updating it anymore. Instead, you’re now supposed to manage tags directly on Icinga Exchange and releases with the help of Github releases or Git tags. I get that this is a rather bold step, but it needed to be done some time. And this time has come. Now it’s time to advance into the bright future of tagging specific points in history as being important. It’s not that difficult, is it?